If you are feeding a variety of foods to your rabbit, it is a good thing because a variety of foods provide all the essential nutrients and helps to keep them healthy. As a result, your rabbit will be happy. Usually, it is found that they prefer to eat different foods. However, you will have to keep in mind that which fruits and vegetables should feed them because some fruits and vegetables may be toxic for the rabbits. This is the reason that one question arises in most people’s mind that can rabbits eat tomatoes? To answer this question, we have tried to provide every possible information in this article such as can rabbits eat tomatoes, how many tomatoes should be fed in a day, does it provide health benefits, and what is the effect of tomato on rabbit health? Can rabbits eat tomatoes? Let’s take a look at the health benefits of tomatoes to know more about it. 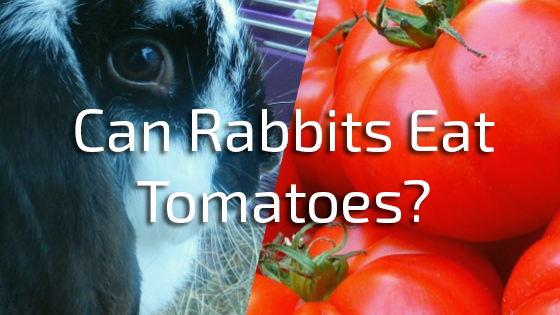 Can rabbits eat tomatoes and is it good for rabbits of all ages? Feeding tomatoes to rabbit is as simple as feeding other vegetables so the answer is yes, your rabbit can eat tomatoes. The vegetable does not affect their health but other parts of the plant such as leaves, flowers, and stems can prove toxic for the rabbit. Not only this, the green fruits are considered toxic. Even though the tomato is considered a good source of providing Vitamin A, C, B6, potassium, and antioxidants, this should not be the main source of rabbit’s diet. You can feed it in small amounts which are not harmful. Tomato stalk which holds the tomato on the plant can be toxic for your rabbit, so you should remove the stalk first. Wash the tomatoes properly because pesticide residues are found on tomatoes. Cut the tomatoes into small pieces and remove its seeds too. The seeds are not good for rabbits. Give one or two pieces of tomato to rabbit with your hands in a day. It is considered that the quantity is enough for their stomach. Keeping these things in mind, do not feed them too much because their fur can be messy from tomato juice. One more thing is that the rabbit does not like to be dirty or wet. So they try to clean themselves after eating the food. Tomatoes play an important role in the treatment of rabbits but it should not be the main part of the rabbit’s food. The red color tomato contains plenty of nutrients such as vitamins, minerals, and phytochemicals. These nutrients help in slow aging of rabbits, reducing inflammation, and fighting cancer. Tomatoes have specific antioxidants called lycopene which appears to be quite powerful. According to the short-term studies, if you are feeding antioxidant-rich foods in large amounts to your rabbit, it can prove to be important in preventing cancer, heart disease, arthritis, infection, and inflammation. By providing antioxidant-rich treats to rabbits in place of junk food, you can reduce the risk of developing diseases. But on the other hand, enough consumption of tomatoes cannot prove to be good for the rabbit’s health. Feeding tomatoes can be helpful for them only in the reference of a healthy diet. It is also found that due to regular consumption of crackers and table scraps, the loss cannot be compensated even by feeding a tomato slice. Food affects the health of your rabbit directly and indirectly. Due to the fact, poor diet is the cause of most health issues. So the consumption of tomatoes has put people in doubt, so it is usually asked can rabbits eat tomatoes. One thing always keep in mind that consumption of tomatoes in excessive quantity causes harm rather than providing health benefits to rabbits. That is why it is advisable to feed it in small quantities. It is found that tomatoes are acidic and contain a high amount of sugar than other vegetables. High quantity of sugar reduces good bacteria while increasing bad bacteria. As a result, your rabbit may have to face various types of digestive problems. If you feed one or two slices of tomato to rabbit in a day or one tomato per week, it is considered enough. As long as tomatoes are fed as treats, everything will be fine but you should not feed dirty and rotten tomatoes to your rabbit because rotten foods can play a key role in leading to diarrhea and other digestive problems. Before feeding it to rabbit, you should wash the tomatoes properly so that pesticide residues can be removed, otherwise, it can be harmful. Rather, even the tomato sauce should not be given to the rabbit because it contains a lot of sugar and food preservatives which directly affect the health of the rabbit. Feeding canned or cooked tomatoes to rabbit, is not good for their stomach because it has been found that they are more acidic than raw tomatoes. Even though lower calories are found in tomatoes, still they are not included in the ideal foods. The quantity of fiber in tomatoes is particularly low. As a result, due to excessive consumption of tomatoes, your rabbit has to face gastrointestinal problems. Usually, it is found that the rabbit stomach does not empty on time because of eating low-fiber food. As a result, they do not feel like eating or drinking anything. Over time, this can cause gastrointestinal stasis, infection, and even death. So when people ask, can rabbits eat tomatoes, we recommend it as treats because excessive consumption of tomatoes is more harmful to rabbit health than health benefits. When people ask that can rabbits eat tomatoes, we will say yes, rabbits can eat tomatoes but only in small amounts. On the other hand, it is not suitable for rabbits of all ages, especially for baby rabbits. The baby rabbits digestive system is very sensitive. Due to the fact, you should not feed them tomatoes as well as any kind of fruits and vegetables until they reach the age of 12 weeks. So if you feed it, these types of foods make it slowly. Wait for 24 hours. You will get their reaction within 24 hours. If you feel that there are no effects on the health of the baby rabbits you can move to the next. But if you find the rabbit upset then you should not provide the tomatoes and any kind of fruits to them. You should wait until you give them any kind of treats. Can rabbits eat tomatoes? After knowing the answer to this question tomatoes are considered better than tomato plants. If you are thinking about feeding the plant to rabbit, it is generally advised that tomato plants especially the leaves, flowers, and stems should not be fed to the rabbit because the green part of tomato plant contains poisonous solanine. The solanine works as a poison for rabbits. Do not let the rabbit come in touch with tomato plants as far as possible. This substance is also fatal for other animals. This substance is found in the whole plant. Even though the rabbit knows by instinct that it is bad for them, keep it away from the rabbit’s reach. Many people consider it to be delicious due to its interesting leaves but they do not know that the serious problems related to the digestive system have to be faced. Even a small piece of the plant can prove to be fatal for them. However, consultants have different opinions about the question can rabbits eat tomatoes and tomato plants as well. If you want to see your rabbit healthy, then we recommend that you should not feed this controversial plant to your rabbit. Even the seeds of the plants are not good for rabbits so we think that it is wise to avoid the plant. Can rabbits eat tomatoes? To clarify the answer to this question, we have tried to give enough information in this article. As you will have known that tomatoes can be used as a safe treat for rabbits but it should not be fed as a staple food because these are acidic and contain high sugar which is harmful to the rabbit’s health. For this reason, tomatoes are recommended to feed in small quantities. In conclusion, we hope this article will definitely prove to be helpful for you and for your rabbit. If you still believe that we need to add more in this article you can leave your question in the comment section.